Super Eagles take on the Pirates of Seychelles at the Stephen Keshi Stadium, Asaba, on Friday by 4p.m and then play an international friendly against the Pharaohs of Egypt on March 26 at the same venue. Camp of the Super Eagles in Asaba is now bubbling as all 23 invited players have arrived the oil-rich city. 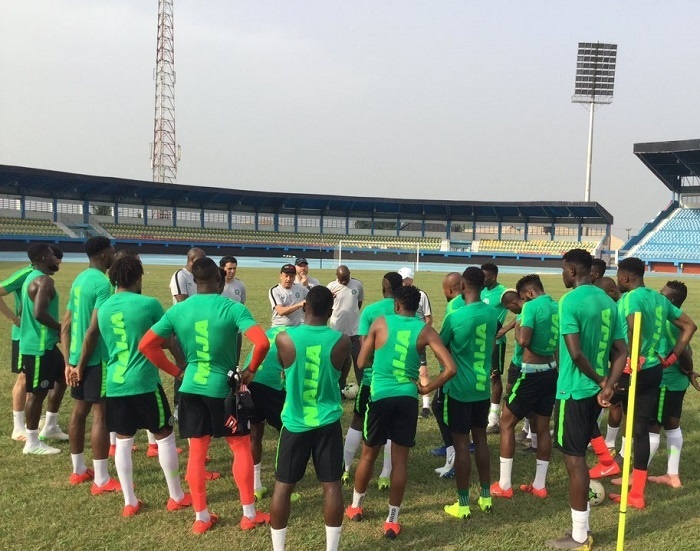 It was a full house on Tuesday when the Super Eagles began their first training session at the Stephen Keshi Stadium ahead of their 2019 Africa Cup of Nations (AFCON) final qualifying match against Seychelles. NAN reports that Odion Ighalo, Alex Iwobi and Semi Ajayi were among the first arrivals in the Super Eagles’ camp in Asaba on Monday.